London, United Kingdom, Monday 8th April 2019 – Canon Europe announces the launch of three compact and cost-effective refillable ink tank printers that expand Canon’s existing PIXMA G Series range. Designed for small office use or budding home-based entrepreneurs, the Canon PIXMA G6050 is a multi-function colour printer with scan and copy capability and a practical front facing tilt-able panel with 2-line LCD. 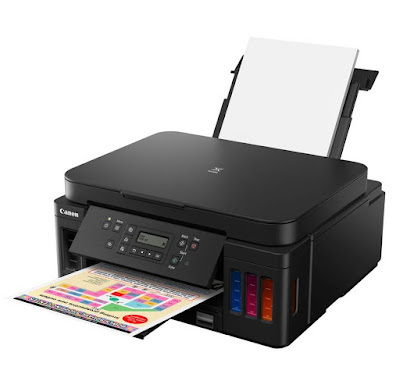 In addition, the Canon PIXMA G5050 is a single-function colour printer with ethernet for secure network connections and Wi-Fi for smart device connectivity. Meanwhile, Canon’s PIXMA GM2050 is a single function black and white refillable ink tank printer that delivers low running costs and high productivity for businesses with mainly mono printing requirements. Each printer is designed for the demands of frequent office use, with better quality, rapid printing and competitive running costs. With enhanced mess-free ink bottles, high-yield ink tanks and a wide array of connectivity options, Canon’s latest PIXMA G-Series printers grant small business owners uncompromised quality and extensive functionality. Whether for an estate agent printing property details or a restaurant chain printing daily menus, costs remain low with Canon’s high-yield ink tanks. Capable of delivering up to 18,000 pages from just three black ink bottles or 7,700 pages from the Canon PIXMA G6050 and Canon PIXMA G5050's colour set1, minimising interruptions and saving time by removing the need to continually purchase ink cartridges and cutting the cost-per-page. All three printers maximise productivity with auto double-sided printing and a 350-sheet plain paper capacity, minimising paper refills and cutting expenditure on paper. When ink does run low, fast paced businesses can take advantage of Canon’s enhanced squeeze-free ink bottles, specially designed for a quick refill to minimise printing downtime. Businesses with substantial daily printing requirements can benefit from speeds of up to 13 ipm mono and 6.8 ipm colour for the Canon PIXMA G6050 and Canon PIXMA G50502. These marginal gains can combine for a significant boost in productivity. The cost savings and productivity gains delivered by these new PIXMA G-Series printers do not mean compromising on quality. Canon’s newly formulated dedicated pigment black ink produces crisp, sharp and clear document text, perfect for producing documents and presentations with professional polish. The Canon PIXMA G6050 and Canon PIXMA G5050 can also produce vibrant borderless photos in sizes up to A4 and printing a 4x6 inch photo in approximately 37 seconds3. Each printer also offers smart and convenient printing via the Canon PRINT app for iOS and Android, and the ability to print from cloud with the PIXMA Cloud Link, including Google Drive, Dropbox and Evernote. Bringing even more flexibility to the process, Canon PIXMA G6050 and Canon PIXMA G5050 owners can print wirelessly and directly from a smart device with AirPrint (iOS), Mopria (Android) or Windows 10 Mobile. For businesses that require a more secure connection, Ethernet connectivity is also available. Small business owners looking to expand to multiple locations can remotely monitor each of these printers with Canon’s Management Information Base, available online. The system enables ink levels and print counts to be checked from a single location so that new ink bottles and paper can be re-ordered before they run out. The Canon PIXMA G6050 and Canon PIXMA G5050 are compatible with a number of new media, including magnetic photo paper, sticky backed photo paper and 3.5” x 3.5” square photo paper, great for those looking to get creative with their printer at home. With Canon’s latest range of high-volume refillable ink tank printers, small businesses or home offices can enjoy cost effective productivity and high printing yields without having to compromise on document quality.